This 1 oz Silver bullion coin celebrates the 50th anniversary of mankind's first landing on the moon. The United States spacecraft, Apollo 11, successfully landed on the moon on July 20, 1969. More than half a billion people watched collectively as Neil Armstrong stepping onto the Moon's surface proclaiming, "That's one small step for man, one giant leap for mankind". Reverse: Representation of the Lunar Module Eagle landing on the Moon behind a large footprint on the Moon's surface. "Moon Landing 1969-2019" and a "P" for The Perth Mint are inscribed. Is Silver a Bargain as Gold:Silver Ratio Approaches 80? The Collapse is Coming. Buy Gold Now. 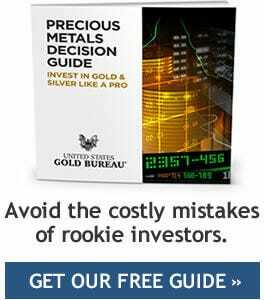 Why Buy Silver from the U.S. Gold Bureau?